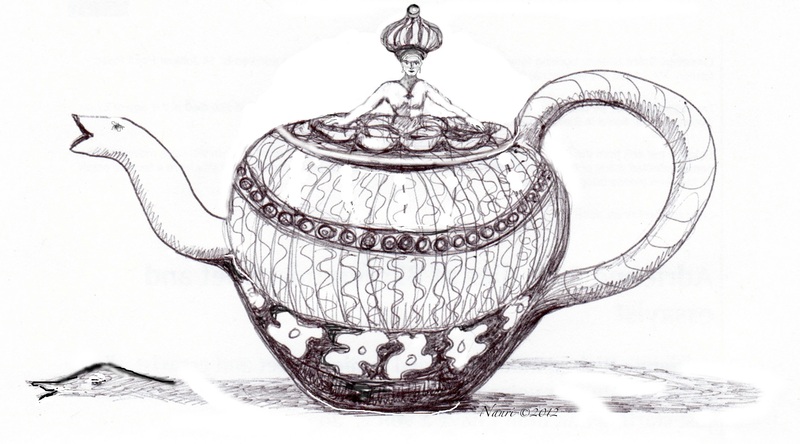 A few days ago, my friend and extraordinarily talented artist Nanri Tenney gave me a drawing she had made of a teapot that was rich with many layers of meaning. Since I also find the symbolism of teapots to be so extraordinarily abundant that I named this blog Goddess in a Teapot, we have decided to collaborate on this post. Nanri has contributed the beautiful drawing and an explanation of what it means to her. I have written a short story using some of the symbols relating to women’s creativity and spirituality and teapots that gave this blog its name. Woman with Bountiful Bowls, a symbol for forward movement and positive feminine energy in our times. This spiritual woman on a teapot lid is offering bowls of food to all. She is holding the world in balance with her nurturing creativity and sustainability. The round teapot represents the world in the process of returning to a healthy state. The spout and handle morphs the globe into a peaceful serpent dragon, a vehicle for positive transformation. The cut-up dead snake below the teapot is the shadow world and represents the transgressions that are done to the earth and its just peoples. The woman’s generous, wholesome work is victorious over these dishonorable exploits. May this creative endeavor of words and image bring kindly awareness to all who read it for the benefit of all sentient beings. Lucia poured water into the tea kettle and set it on the stove. She then measured two scoops of tea leaves into her grandmother’s century-old teapot, not noticing their tangy aroma or curling beauty, before replacing the lid. Only rarely did the teapot leave the battered, heirloom cabinet where Lucia kept her most precious family mementos, but today she hankered to touch its round and inviting belly, admire the delicate designs winding around in a never-ending circle, and savor again the hours that she and her grandmother had spent chatting while drinking tea from the pot when she was a little girl. It was a simple teapot just like hundreds of others that must have been made by the same factory in 1912, but to Lucia it was a gateway to all she had lost and did not know how to regain. Lucia’s grandmother had passed away a week before. Now Lucia was contemplating her own life compared to that of her grandmother at her age. As sales manager of a busy advertising agency, for years Lucia had spent ten or more hours a day poring over client lists and sales statistics. Friendships made earlier in life had dimmed and she had never had time to make new ones. At her grandmother’s funeral Lucia had met women of all ages and backgrounds — some lifelong friends of her grandmother, some acquaintances who had been touched by her kindness in some way – there to comfort each other in their loss of someone who had inspired, encouraged, and been there for them in times of need. Lucia’s grandmother had lived an everyday faith in which she cherished every flower in her garden, every human being she met, every day as being made up of moments of grace while Lucia had increasingly had come to see her hours and all she experienced in the world as tools for improving each month’s sales report. Her grandmother had always seemed content and where she knew was supposed to be, doing what she was meant to do, even if she were just washing dishes, or, in her last months, sitting quietly in the dayroom of her nursing home. Lucia realized that she never felt happy anymore and that each sales report seemed less important even as she spent more time improving the figures on it. Lucia’s reverie was interrupted by the whistle of the tea kettle, so she waited a moment for the water to stop boiling, then poured it into the teapot and the tea began to steep. The faint whistle awoke one of Spirits Goddess had assigned to Earth as a caretaker of the world’s women and their component of human spirituality. The Spirit had taken a short nap, only a few thousand years, merely the wink of an eye in terms of human history. Other sister Spirits had continued on during her rest, answering the cries of those in despair, gazing down with compassionate eyes, always offering just what was needed even if the humans thought they wanted something else. The whistle reminded her of the delightful hums, chants, and music that had come from all the Goddess sacred sites around the world when she had first fallen asleep. She wiped the mist of time from her eyes and looked around the see where the sound could be coming from. She wanted fly down there immediately and perform some miracle in appreciation. Instead of a globe full of caves, temples, shrines, groves and other sites sacred to the Goddess, the Spirit found that so many had been abandoned and razed that entire communities existed without a single image of the female aspect of the Divine. The places that had once been so holy were now silent, bereft of human hearts and minds. The Spirit, first puzzled, then troubled, sought out the humans who were so dear to Her and searched their souls. She found that in many places, the names and images of the Goddess were now reviled or forgotten. Her hymns and stories were no longer told and her music no longer filled the air. Women, who once saw themselves as the sacred givers of life and served as shamans and priestesses, now no longer knew that Goddess was within them and their voices were banished from holy places. As a Spirit, she could see both what was manifest in the outer world of physical reality, and what was also true within the people expressed in the language of symbols. All over the world she saw the sacred snakes cut into pieces, made into objects of fear and revulsion. For millennia, snakes had been symbols of the renewal of life and transformation and had accompanied the priestesses in their ceremonies. Many names of Goddess called her a serpent. In some places, the serpent was the symbol of wisdom and enlightenment. In others, it was the life energy within all humans, ascending upwards when awakened. Could the sacred serpents be made whole and once again bring their life-giving power to humans, the Spirit wondered? Could women as isolated from one another as the pieces of the serpent find each other and their own sacredness within themselves? A voice, that of Goddess Herself, whispered to Spirit, “look again.” Spirit looked not only at the sacred sites and practices that were no longer, but into the homes and hearts of women and saw where Goddess had hidden Herself. Spirit saw tea parties, beauty salons, and quilting bees where women had gathered and shared themselves with one another for generations. She stood by women all over the world who were risking their lives to educate girls and delighted in the young ones devouring the knowledge. She smiled at dance teachers showing young women how to love their bodies and to be strong and expressive with them. She experienced billions of acts of kindness in which one woman helped another woman in need feed herself and her children, leave an abusive home, or find a caring space to grieve. She saw women gather to heal the Earth Herself. It was not in the palaces and processions, but in the ordinary days in which Goddess still dwelled. It was time for Spirit to act, to rise from her slumber and once again serve the women of the Earth. But, how to manifest herself? What door could she find to enter their world? She followed the whistle to the kitchen of one woman and spotted the teapot. She noted the Earth that had grown the tea leaves, the water that would make them into tea, the fire that heated the water, and the air that made the tea kettle sing as it boiled. She witnessed how the teapot was transforming the woman who drank the tea by its memories of the grandmother who had been the embodiment of Goddess on Earth. She saw how teapots and tea had been the center of so many gatherings of women and how tea-drinking is something that women all over the globe have in common, and she knew what she must do. Spirit entered the teapot and it immediately transformed. It glowed with light and the spout became the snake, ready to do its part to bring about the needed changes. The Spirit popped out of the teapot, the blooming top her new headdress, and she made a transforming tea that she handed out to every woman on Earth. Whether it magically appeared in a cup of tea they were holding, or it rained down on them as part of a monsoon, or became part of their bodies in some other way, each woman received her share. Lucia suddenly tasted the warmth and sweetness of the tea. She began to think not of her own sadness and loss, but of those women who had made the tea she was drinking. She thought of those who had grown the tea, those who had picked it and packed it for shipping, those who had worked in offices selling it to the tea company, and the cashier who had sold it to her at the supermarket. She realized that each of those women had lives and cares just as she had, they had families who they were working to feed, and, like her, they wished to live long and healthy lives. As soon as Lucia thought of those people, they thought of her and they realized that she was just the same as they were. Lucia, and all the other women, began to live in community with all the women of the world. Her decisions — whether she walked to work to avoid contributing to the global warming that harmed women in lands far away, or choose a small women-owned business as a vendor at work, or buy a dress that was fairly traded — were all made with the women of the world in mind. As soon as she felt herself a part of a worldwide gathering of women, she realized that she was more than she had believed herself to be and the light of the sacred within herself was relit. She knew that she, too, was a manifestation of Goddess on Earth and the she had a divine place that only she could fill, and so it began to be with all the women of the world. In time, a millionth of an instant to the Spirit, she looked again through the eyes of the soul and saw the pieces of the snake beginning to come together again, shining, powerful, and joyful. The Spirit, her work done for just that moment, poured herself a sip of tea from Lucia’s pot, surveyed the world, and smiled.